May I need a psychological therapy? Online Psycho-oncology facilitates the access of patients to psychotherapy from any point in the territory, with no need of moving from home, and, thus, performing the psychotherapy in a comfortable, warm and intimate environment. The time spent on treatment is the one from the therapy itself, this modality of psychotherapy results easier to perform and accessible, as it saves time and travelling costs. More than 100 oncological patients have already benefited from this online resource since the start of this project in 2014. Before the availability of this remote therapy, about 400 patients had been treated in the Department of Psycho-oncology of Duran i Reynals Hospital (ICO Hospitalet) with presential group therapies, for 10 years. Nowadays, the two types of therapy are being simultaneously performed in ICO-Duran i Reynals, and we are studying which type of therapy is the best option for each patient. “The Online therapy (the Refuge) has meant for me a space where to take off the emotional armor that I had used to protect myself during treatment. There, I was able to share, without fear, feelings that seemed to be contradictory. These feelings turned out to be common among many oncological patients”. “The online therapy was for me the opportunity of sharing my illness and my feelings with others. I felt reflected on them. It was a mirror that returned my image in other faces with which I normally had no need to explain nothing, because they already knew the emotional chaos I was experiencing after this disease, which changes you inside and out”. Is it sure that I do not have metastases? What if I had metastases and they have not noticed? Have I had the life that I wanted so far? Why does life give me this blow so hard now? How do I explain it to my love ones? Am I going to get out of this? I cannot die now; I still have many things to do. I feel on the edge of a precipice, I can fall at any moment. Life is not eternal … death knocks at my door. Will I be able to resist this? It is sure it is working? What if, when it ends, it has not served anything? Will so much suffering be worthwhile? How can chemotherapy cure me when it seems to be poisoning me? How do I explain to my young children what is happening to me? Why am I so emotionally unstable? Why am I so fragile? Everyone is happy because I’ve finished the oncological treatments … But I don’t feel happy! Have I changed the things that I wanted in regards to cancer? Have I improved as a person? I see my life in a different way, I want to change, prioritize those really important things. It is difficult for me looking to the future, I’m afraid, what if the disease comes back? The relationship with my body, with my partner, intimacy, sexuality … It is all altered. Cancer patients explain us their emotional experiences along their cancer process. Psycho-oncologists provide their commentaries in the book Las emociones del cáncer, edited by Mayo Editions, sponsored by the SEOM_Sociedad Española de Oncología Médica. You can entirely read the book in this link. I shared with my wife and friends what was necessary, I never thought hiding anything. I maybe expected them to have some doubts, but they never had. I think it was because of my way of focusing the illness. Gabriel: I used to prioritize my work, as society leads us to do, but now I prioritize my personal relationships. A therapy group is a meeting of people who have and share something in common which unifies them all (cancer). They also share a desire of a common goal: the achievement of a greater emotional well-being. Therapy groups online are similar to the presential therapy groups, but being performed from home. About 100 people have already performed them. The first pilot group we did in this project, Psychooncology Online, was an amazing experience, made up with 5 women survivors of breast cancer and a psycho-oncologist, Dr. Ochoa. Once a week, at a fixed schedule, we met online for 80-90 minute sessions. The only technological requirement was a computer connected to the Internet and a webcam with a microphone (which could be lent by the hospital). We connected using a multi-videoconferencing platform called VITAM https://prova.vitam.es:5001/, provided by the University of Girona. Participants put their name and, in “three clicks”, the session began. It was very easy. In this type of group therapy, 12-week meetings are scheduled and designed to assimilate the disease and make the need changes to achieve a greater emotional well-being and quality of life. The last session is presential. It is worth knowing one to another, being able to touch each other and making real what started as a virtual experience. Subsequently, we see each other again in two other control sessions, one at 3 months and the other at 12 months after the end of the twelve therapy sessions. Psycho-oncologists assess your psychological state at various times along therapy using questionnaires that help you to know how you were before, now, and how you want to be. Everything is adapted to your experience with the disease. Psychological therapy in cancer patients may be necessary at different stages of the disease. Professionals, usually nurses or oncologists, who establish a closer relationship in the first moments with the patient, can make an initial assessment of the need for psychological care and make referral to specialists in Psychooncology when appropriate. The most common emotional alterations in cancer patients are especially significant at that times called “crisis”, which are usually: when receiving the diagnosis and, above all, at the end of oncological treatments and returning to daily life. Other critical situations to consider are: when the disease can not be eradicated and relapses occur, when there is no possibility of active treatment and/or the awareness of death closeness/imminence (end of life) appears. The emotional impact of all these situations may require psychological treatment. How to know if I need psychological treatment? The presence of emotional distress is the easiest criteria used in most countries to assess the possibility of receiving psychological treatment in people suffering from cancer. Specifically, several studies show that overcoming an “emotional distress” score of 5 on an emotional scale or thermometer can be a wake-up call for treatment. High emotional distress is the significant presence of illness-related anxiety or low mood. 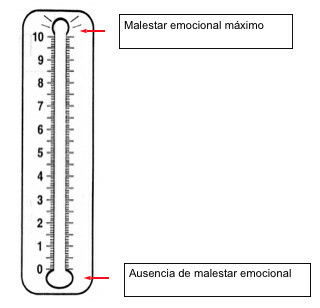 It is assessed by asking the patient how he would value his degree of emotional distress on an emotional scale or thermometer from 0 to 10, where 10 is the highest level of emotional distress and 0 the absence of emotional distress. Emotional distress is an unspecific and simple measure that is useful for synthesize the cancer experience in its most difficult and unpleasant aspects. Although a high score may contribute to consider the possibility of requesting psychological help, it is important to also assess the personal and social strengths and resources. It is common to experience high emotional distress but also feeling capable of facing the disease. In these cases, psychological help may not be necessary. Psychological therapy, when specifically aims at reducing this emotional distress, focuses on providing emotional-management strategies, techniques or explanations which contribute to better regulate the emotional reactions from the disease. Extreme and adverse situations such as cancer tend to generate a deep vital questioning. This consists of rethinking and changing the way of seeing oneself, the others, the world, and life in general. Feeling that life has been threatened is usually the engine of this vital review that looks for higher levels of development, happiness and personal growth. Psychological treatment also facilitates the realization of these positive life changes, being another great motivation to ask for specialized help. In these cases people may also be experiencing emotional discomfort or not, but the goal is not only its control, but rather making significant life changes. People have the inherent desire for growth, fulfillment and happiness rather than just seeking to avoid misery, worry or anxiety. Emotional or psychological distress is also engendered when growth is frustrated. Personal growth or positive life changes following cancer occur in many domains and areas: 1) Changing the way they see themselves (increased confidence, self-esteem, and empathy), 2) Changing the way they see the others (feeling them closer and having a greater ease of communication) and 3) in the philosophy of life or existential position (focusing on the present moment, greater appreciation for life, life priorities and values changes, increased interest in spiritual and existential issues, and the search for meaning and vital meaning). Recently, psychological treatments have been created integrating both goals in cancer: reducing emotional distress and facilitating personal growth. Our research group called Positive Psychotherapy to this type of treatment that was designed in 2010.